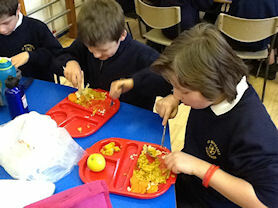 We eat our school dinners altogether in the hall, as one. 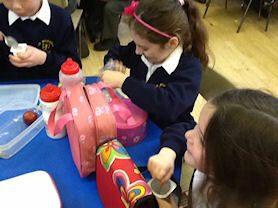 Younger and older children sit and eat together round the tables in a family atmosphere. 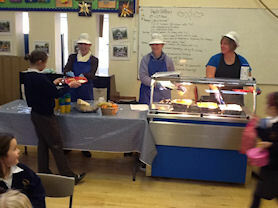 If you would like to know more about the meals on offer from our caterers, please have a look at the menu on this page. Meals cost £2.10 and need to be ordered two weeks in advance (or up to a term earlier, if that is easier), so that the food can be bought as needed by the kitchens. 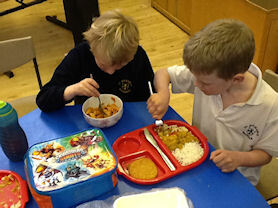 To order school dinners, please use the Order Form on our Downloads page. Our dinner ladies serve up. We eat together in the school hall. Enjoying a healthy, hot school dinner. Some pupils bring packed lunches.